Today is the official re-opening of Melaine Boutique. 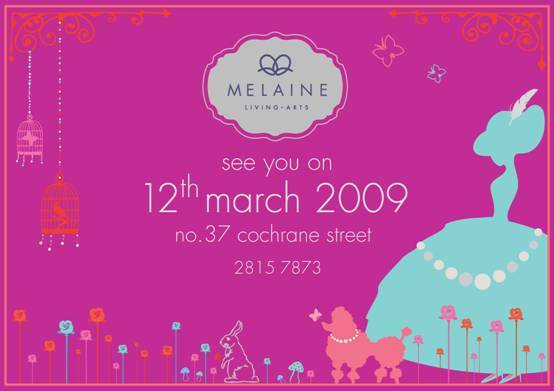 Melaine was located on Lyndhurst Terrace, but has moved to Cochrane Street (near Pizza Express). Melaine Boutique has amazing little ad hoc gifts, unusual vases, gorgeous jewellery, table mats and coasters, pretty gifts for newborns, photo frames, one off clutch bags, objects etc – it’s hard to walk out of the store without something! I visited the closing down sale of Melaine Boutique recently and had THE WORST shopping experience. The main sales lady was a terrible bully with a serious attitude problem — she yelled at me in front of all the other customers for attempting to take a picture of a hair accessory. When I calmly explained that I wanted to send the photo to a friend to ask whether she’d like for me to buy her a hairclip too, she grabbed my phone and demanded that I delete the photo — even though I hadn’t taken the picture! In the end I left without purchasing anything. With that sort of “customer service” no wonder this store is closing down. Good riddance!